Goose Creek candles have been hit or miss for me but I still can’t resist purchasing at least one of each scent every time new fragrances hit their website. 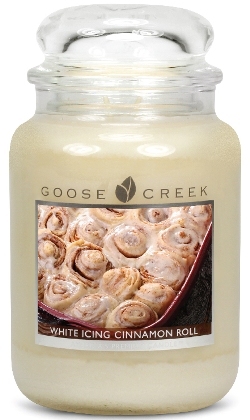 One new scent that sounded yummy… White Icing Cinnamon Roll. The name alone had my mouth watering, so hoping and crossing fingers this is a good one. Made with love from Mom. The aroma of mouth-watering white icing cinnamon rolls fresh from the oven. First impression… I smelled cinnamon the most with vanilla icing. I’m really hoping the doughy cinnamon roll comes to life once the candle was burning. I lit this candle in my master bedroom to start out and ended up moving it to a much smaller room a few hours later. I wanted maximum scent throw and definitely achieved that in a smaller room. The aroma… it was perfect. I smelled a doughy bakery with the perfect touch of cinnamon. Cinnamon rolls all the way and it was absolutely scrumptious! The only negative… the scent throw was pretty light. This candle did scent my small bathroom but that’s it. Anything larger and I would worry about smelling the fragrance at all. So my advice, try burning two candles at once or try melts for a stronger scent throw. Strength – on a scale of 1 to 10, I would rate this candle a 2 in a really large room. 4/5 in a medium room and maybe a 6/7 in a really small room. This candle burned pretty good. No wick issues other than. It just burned very slow. White Icing Cinnamon Roll was a very enjoyable bakery scent and I would absolutely purchase it again given the chance. Just keep it mind it was pretty lightly scented for me so next time I order it, I’ll stick to small rooms to burn it in for maximum scent throw. Definitely give this candle a whirl if you’ve been in search of a doughy cinnamon roll scent. It was yummy.